The US Air Force orders more C-27J small transport planes….. But that’s another slight from Gates……..
Alenia North America, a unit of Italy’s Finmeccanica, has received a $319 million order from the U.S. Air Force for eight C-27J tactical transport aircraft, bringing to 21 to total number now ordered by the U.S. Air Force and Army. The aircraft will be delivered during 2012 to L-3, Finmeccanica’s partner on the program, Finmeccanica said in a statement. The 21 aircraft now ordered by the U.S. are worth $812 million, the firm added. The Dog has done some research ……. When the Army gave up the C-27J…….They made a deal….. The deal was the Air Force gets the aircraft….. The Air Force Operational Unit will be assigned and subordinate to the Army! The Unit is Air Force drivers and staff….. But their Operational bosses are ARMY…..
What continued efforts does Army Aviation have planned for the future? The future of the C-27J is to rapidly field and deploy the aircraft and its crews as they become available for deployment. The limiting factor for the next few years will be class throughput for training both pilots and loadmasters and the production of new aircraft. The Army Chief of Staff has directed that all roles and missions dealing with the movement of cargo via fixed-wing aircraft be handled by the Air Force, therefore a plan is being developed to limit or divest the remaining cargo carrying capability of Army fixed-wing aviation. The Air Force is on board to support the Army so no future gap exists by utilizing a “Platform Neutral” concept. In layman term’s, they will support the Army with whatever asset they deem appropriate, i.e., C-130, C-27J, etc., in the previously mentioned CAB structure. Why is this important to the Army and Army Aviation? By transferring the C-27J from the Army and Army Aviation and developing a plan to limit and/or divest the remaining cargo assets, the Army can save money in both procurement and operating costs that can go to other programs deemed in-line with Army roles and missions. Army Aviation has the opportunity to employ true joint operations with the embedding of the Air Force C-27J unit into an Army Aviation unit. This will be a continual relationship and foster a cohesive support mechanism to the ground commander, utilizing all available aviation assets to “get the job done.” As events have shown, the ability to move what needs to be moved, where it needs to be, in a timely manner, are essential. It doesn’t matter if we are talking about war, natural disasters, humanitarian relief or homeland security. An integrated aviation lift capability will go a long way in providing the necessary tools to the commander, Army Aviation, and the United States Army. Update #2…..Where ya going put the C-27J’s?……And are there going to be more?……Will the Coast Guard get some? Do they go oversea’s WHERE THE ARMY ORIGNALLY SAID THEY NEEDED THEM? Debate regarding addition of the Joint Cargo Aircraft (JCA) to the military’s inventory has spanned numerous years, and the program has endured many revisions. Envisioned as a short-haul asset designed to deliver supplies the “last tactical mile,” the JCA morphed from a joint aircraft into an Air Force–only platform that will reside solely in the Air National Guard (ANG) as the C-27J..1 Its assignment to ANG units makes it a dual-role aircraft, used to support civil authorities in domestic crises in addition to fulfilling its combat role. The National Defense Authorization Act for Fiscal Year 2010 (Public Law 111-84, 28 October 2009) included funding for the Air Force to purchase the first eight of a proposed 38 C-27J aircraft for the ANG..2 Despite debate about the “correct” total number of C-27Js to procure after this modest start, a larger issue remains: where will we base these aircraft, and how will the C-27J support its nascent homeland security mission? Congress has weighed in on these issues with questions regarding beddowns and funding but has given only passing recognition of the C-27J’s potential homeland security role. In separate reports to be attached to their versions of the FY 10 National Defense Authorization Act, both the House Armed Services Committee (HASC) and the Senate Armed Services Committee (SASC) directed the National Guard and Air Force to report on a C-27J basing plan within 120 days of the act’s passage. The HASC’s report contained concerns about the 12 C-27J beddowns previously earmarked for the Army National Guard and urged the Air Force to consider those locations for future C-27J basing. 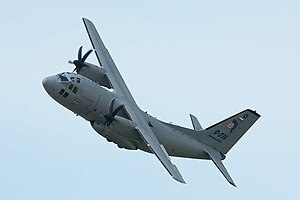 Language in the SASC report left the door open for additional C-27J purchases, referring to the currently budgeted number of 38 aircraft as a “floor” rather than a “ceiling.” The SASC report also notes that any study regarding intratheater airlift must also give “due consideration” to the contribution of these systems to the homeland security mission.3 Concerns remain about whether 38 C-27Js represent a sufficient number for performing missions proposed for the aircraft.4 In a letter of 11 June 2009 to the chairmen and ranking members of both the HASC and SASC, the Adjutants General Association supported “fully funding 78 aircraft for the JCA program,” stating that doing so would “provide a critical capability to state emergency management and homeland security missions.”5 Regardless of the correct number of C-27Js, the aircraft seem destined to play a role in the burgeoning partnership between the Department of Defense (DOD) and Department of Homeland Security (DHS). In today’s New York Times there is a piece about General Patreaus signing off on an order that authorizes the US Military to ‘take the gloves off’ and ‘go hunting’ or ‘disrupt militant groups or counter threats in Iran, Saudi Arabia, Somalia and other countries in the region’, according to defense officials and military documents. This was probably leaked by some regular army people who really don’t like the increase in Special Operations in the region…..
As with any large amount of people doing a lot of things…. The Dog has been wondering for a long time when the US was going to go on the offensive…..
No one likes to go to war…but if you have to go……Go hard……. With your heart in it…….. The Powell Doctrine……Massive amounts of overwhelming force……. ALL WAR campaigns carry risk…. Barack H. Obama, the Commander-in- Chief, and Black, Wartime Democratic President…..
General Petraeus’s order is meant for use of small teams of American troops to fill intelligence gaps about terror organizations and other threats in the Middle East and beyond, especially emerging groups plotting attacks against the United States. 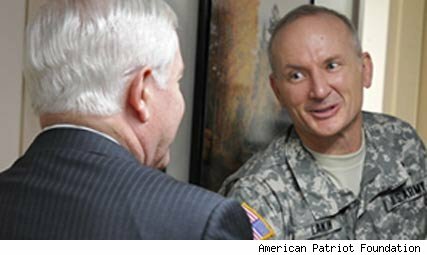 The US Army will discharge Birther Lt. Colonel who refuses to deploy…. Solider’s jobs are to serve…..
That’s what they volunteer for….. If you don’t think your Commander – in Chief was born in this country…and you don’t think he’s entitled to give you orders…you don’t belong in the military…. The Army will court martial a lieutenant colonel who refuses to deploy to Afghanistan because he won’t accept orders from President Obama, whom he considers unqualified to be commander in chief, military officials said Wednesday. Army doctor Lt. Col. Terry Lakin believes Obama wasn’t born in the United States, and therefore does not meet the constitutional requirements to be president, NBC News reported. Lakin refused to report to Fort Campbell, Ky., for deployment to Afghanistan, and instead showed up at the Pentagon, where he was informed that he would face court martial. His Pentagon building pass and government laptop computer were seized. The 18-year Army veteran is under investigation for failure to report for deployment and for conduct unbecoming an officer, The Associated Press reported. Getting ready to deploy to Afghanistan……. 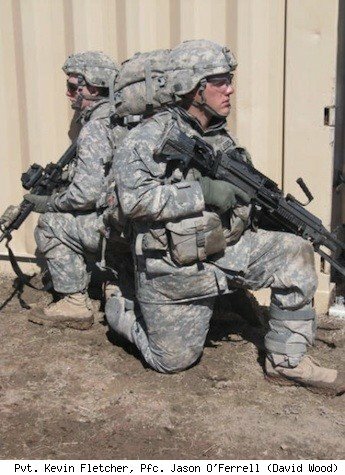 A piece on how the U.S. Army gets its troop ready to go fight in Afghanistan…..
CAMP GUERNSEY, Wyo. — Looking for a place to prepare for its yearlong combat tour in Afghanistan in September, the infantry battalion that calls itself “the Wild Boars” settled on this remote patch of windswept high plains. For a month, its soldiers battled blizzards and sub-zero temperatures, conditions that are common to Afghanistan’s mountainous terrain. They practiced shooting almost straight up steep ridges, and straight down. They shot daytime and nighttime. They shot while running and they shot while running and wearing heavy packs. They practiced rappelling their wounded down mountainsides. They practiced calling in live artillery fire. The logistics guys practiced pushing hot meals, water and ammo out 15 miles to remote patrol bases. 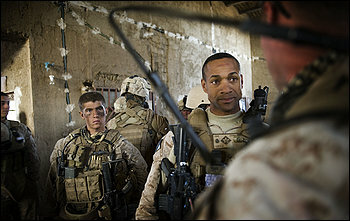 They ran night patrols and practiced chasing down insurgents who had set ambushes for them. In accordance with the Army’s three imperatives, they moved, they shot, they communicated. For the first frigid days they felt sorry for themselves, coming as they did out of the semi-tropical warmth of Fort Polk, La. Then they got down to business. They lived hard, waking with frost on their sleeping bags, shaving in ice water, eating with their gloves on. They knelt in quick huddles, hunched against a cutting wind, to game plan their maneuvers. And at month’s end, they flew home, having first practiced how to gracefully reintegrate with their families at Fort Polk, a skill critical to keeping military families intact. President Obama’s “surge” of 30,000 additional troops into Afghanistan is well under way, with the final units arriving late this summer. Less visible is the continuing rotation into and out of Afghanistan of the 83,000 U.S. troops already there on 12-month deployments. Combined with the 86,000 U.S. Army soldiers serving in and around Iraq, the war imposes an unrelenting schedule on troops and families. It means soldiers spend weeks away from home on field exercises, replicating the conditions under which they will operate in combat. COMMANDER, CENTRAL COMMAND | TAMPA, FLA.
Petraeus (who is a Four star General ) is a man of the pen and the sword, an expert on counterinsurgency, a student of history, a Princeton doctorate-holder, and an avowed intellectual, committed to revolutionizing how the military conceives of war and tailoring its strategies for the 21st century. As the war in Iraq went disastrously awry, Petraeus resurrected the lost military art of counterinsurgency while waging his own insurgency inside the Pentagon to win control of the war effort. Having co-authored the new bible of counterinsurgency — the FM 3-24 — and having successfully put it to use during the troop surge in Iraq, Petraeus has been working methodically to reshape the armed forces to fight conflicts of the future that look startlingly like those conflicts of the past he has studied so carefully. In the immediate aftermath of the Cold War, the United States followed the Powell Doctrine, dedicated to the idea of striking only with overwhelming force; today, it’s being supplanted by the Petraeus Doctrine, which recognizes the primacy of the civilian and the importance of hearts and minds in modern warfare. But Petraeus faces a severe test of his ascendancy in Afghanistan, where this great thinker about small wars comes face to face with a long war that, no matter how necessary, may not be worth winning. Reading list: Eastern Approaches, by Fitzroy Maclean; Butcher & Bolt, by David Loyn; To Live or to Perish Forever, by Nicholas Schmidle. Wants to visit: Iraq (after the 2010 elections). Best idea: That countering terrorism requires more than counterterrorist forces (i.e., that it requires whole-of-government approaches). Worst idea: That the New York Yankees wouldn’t make it to the playoffs. Gadget: Secure and nonsecure laptops, wherever we are. Expect the 2012 buzz to get louder: Army Gen. David Petraeus, commander of U.S. Central Command and earlier the top U.S. general in Iraq, will visit Saint Anselm College in New Hampshire later this month, the St. Anselm Crier reports. ‘If you can’t beat’m join’m’….The US puts Kurdish and Iraqi troops together to patrol their border…..
A string of checkpoints has appeared on the roads that spoke out from this volatile city, guarded by hundreds of American soldiers working with Arab and Kurdish troops. The joint operation along one ofIraq’s ethnic trouble spots began with a deliberate lack of fanfare, but it constitutes the most significant military mission by American forces since they largely retreated to bases outside Iraq’s cities in June. The operation began this month after labored negotiations with Iraq’s Arab and Kurdish leaders. The immediate goal is to bolster security ahead of bitterly contested elections in March along an ethnic patchwork of lands that has been devastated by catastrophic attacks. The ultimate strategy is to defuse political tensions along a fault line that could easily rupture, sundering the country once American forces leave, or even before. The operation underscores the extent to which American military remains an arbiter of Iraq’s most intractable conflicts. “What we’re doing is forcing the wound to close,” Lt. Col. Christopher L. Connelly, a battalion commander with the First Armored Division, said at one of the new checkpoints being erected on the highway that links Mosul to Erbil, the capital of the Kurdish region. This seems to be a very good move…..The Dog believes that when it’s said and done……Iraq will be divided into Federal States just as Vice President Joe Biden suggested a year ago…and that won’t be a bad thing at all…..
'If you can't beat'm join'm'….The US puts Kurdish and Iraqi troops together to patrol their border….. The United States …..not the United Nations is adopting Haiti right now….. I was listening to White House Press Secretary Robert Gibbs answer questions from reporters today…..when the questions got around to Haiti I listen harder…I was looking for one question and knew it was coming sooner…or later…..
Gibbs cleared his throat, I think…and went on to say that the Haitian President is in charge of his country…….really? While Rene Preval is the President of the country….he is right now just a survivor of his countries worst natural tadegety…he has no army…no police force to think of..his country has no governemnt…he has just about nothing….The American’s have the assets, which are flowing into the country, and will continue for some time….. I submit to you that we don’t want to admit this but the highest commanding military person from the United Sates acting under the UN charter and his commader-n-Chief..in consoltation with The Haiti President (if he can find Preval and talk to him) is in charge of the country at this time…. (as I write this piece)…. The country’s future and its number of survivors will depend on the United Sates military which will have to secure the country…serach for survivors and recover the dead…provide shelte communications and food for its populas…take care of the sick and wounded and provide security for the survivors….. While countries from all over the world will lend a hand, and support..it will be the top U.S. Army General in a few days that will command the operation……President Preval will be located and pulled into the net’ to make decisions sooner hopefully than later….. But with such a poor country…..American and foreign troops will have another place to be in for along, long time…..
…..as the Dog would say…’that just is’…….